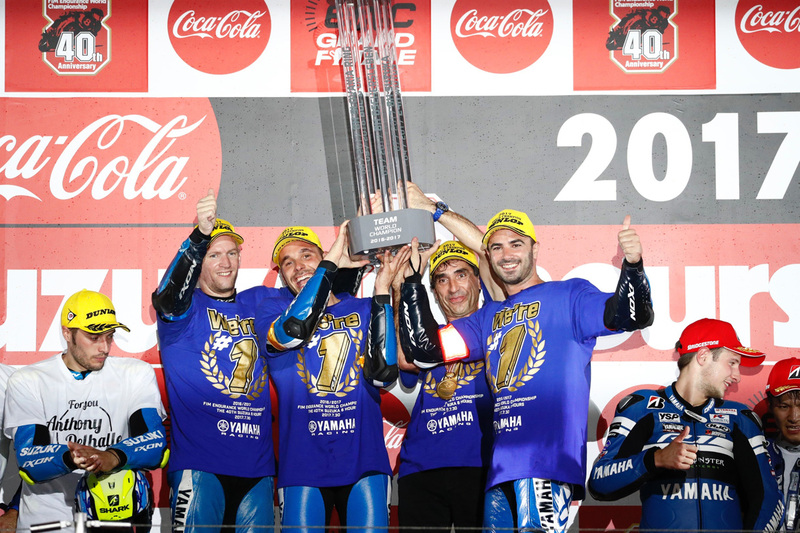 July 31, 2017 ― At the 40th Coca-Cola Suzuka 8 Hours Endurance Road Race held on July 30, 2017 at the iconic Suzuka Circuit in Mie Prefecture, Japan, the GMT94 Yamaha Official EWC Team ran a controlled and mature race to finish in 11th and successfully add a third Endurance World Championship title to their crowns from 2004 and 2014. The French team of endurance specialists didn’t have the easiest start to the season, coming in 9th place at the season-opening 24 Hours of Bol d’Or held in September last year. But from there, GMT94 went on an incredible three-win streak and closed the gap to the Suzuki Endurance Racing Team at the top of the standings to just a single point as they headed to Japan for the Suzuka 8 Hours, the last round of the season. The race would be a straight shootout: whoever got the checkered flag first would win the EWC title. The GMT94 team started the eight-hour race from 15th on the grid with Niccolò Canepa lining up for the Le Mans dash to the #94 YZF-R1. The Italian started climbing through the order just 30 minutes into the race despite the less-than-ideal conditions with intermittent rain falling in sections of Suzuka Circuit’s west course. He then came in for the first pit stop, passing the bike to his veteran teammate David Checa, who kept up the pace set in the first hour. As the hours wound down, the French team were able to reel off consistent laps in the 2’10s as they focused not on winning the race, but on controlling the point difference to their championship title rivals. Third team rider Mike Di Meglio made a strong impression on his Suzuka debut in the Endurance World Championship, bringing the team as high as 8th before a 30-second stop-and-go penalty relegated them back to 11th. This was still well ahead of their main title rivals, however, and the team carried on with their strategy and focused on maintaining their pace. As evening fell on the track, Checa went out for the final stint, coming in for a brief pit stop before taking the checkered flag and clinching the Endurance World Championship title, the third one to the team’s name. The YART Yamaha Official EWC Team also competing full-time in the Endurance World Championship ran consistent laps for the entirety of the race and was never far from the front. Despite a small technical issue with the bike late in the race, they overcame the time deficit to take back 5th at the checkers and 3rd in the series ranking.